Field Reports provide regular updates on the overall situation in each of seven locally-defined Karen districts. Each district will be the subject of at least one Field Report per year. The reports are written by KHRG staff, drawing on all information submitted to KHRG that relates to a particular district. KHRG trains community members in Southeast Burma to document individual human rights abuses using a standardised reporting format; conduct interviews with other villagers; write incident reports; and write general updates on the situation in areas with which they are familiar. 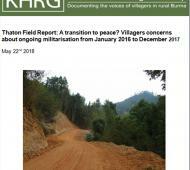 This Field Report analyses information from Mergui-Tavoy District between January 2016 and December 2017. 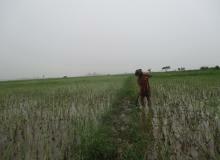 It describes different human rights violations and other issues important to the local community. This Field Report describes events occurring in Thaton District between January 2016 and December 2017. It includes information about the military situation in the post-ceasefire period, ethnic and religious discrimination, and violence because of conflicts about land use. This field report includes information from Toungoo District between December 2015 and December 2016. It describes different human rights violations and militarisation, land confiscation, displacement, development projects, discrimination, drugs, taxation, health and education.